It’s that time of year again when everybody is getting back in shape. Gyms are full, workout classes are full and everyone seems to be trying to make good on their resolutions. When most people think about getting in shape and looking their best, they picture themselves with a trim waistline and a six-pack. 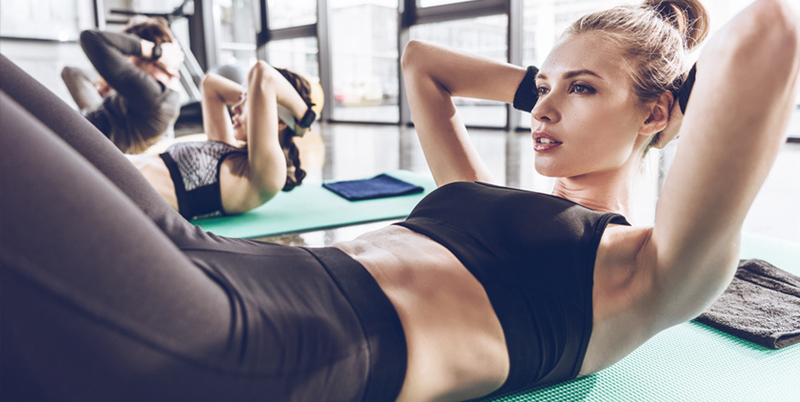 Turning those visions into a reality takes a lot of hard work, so how bad do you want those killer abs? Here are five exercises to get you started. A full-body strength training exercise, burpees work arms, chest, quads, glutes, hamstrings and abs. Keep your arms at your sides and stand with your feet shoulder-width apart. Balance your weight on your heels. Lower into a squat by pushing your hips back and bending your knees. Place your hands on the floor in front of you and shift your weight onto them. Jump your feet back, landing softly on the balls of your feet. This will put you in a plank position. While tightening your core, jump your feet forward so they land slightly outside of your hands. Lift your arms over your head and jump up as high as you can. When you land, go right back into a squat to prepare for your next rep.
A challenging core workout, V-ups target the abdominals and obliques while helping to strengthen your back, quads and hamstrings. Lie flat on the floor with your arms extended over your head and your feet suspended just above the floor. Bending at the waist, lift your legs to a 45-degree angle and stretch up with your hands to touch your toes. Focus on using your abs versus momentum. Slowly lower back to the starting position. Not just for yoga class, the plank is a killer abs workout when done correctly and has several variations to target different muscle groups. This version of the side plank targets your shoulders, waist, abs, back, thighs and glutes. Start in a plank position. Twist your body up to the left so that your left leg is on top of the right and your right forearm is supporting your weight. Engage your abs and try to keep your spine lengthened. Lift your left leg up just higher than your left hip. Place your left hand on your hip or raise it towards the sky to help maintain alignment. Keep your waist up and try not to sink into your bottom shoulder. Hold the position for a few seconds, lower down and repeat. Switch sides. The side plank knee tuck is a great exercise for toning because it requires hip control, balance, and coordination. Lie on your right side. Place your right forearm directly underneath your right shoulder. Both feet should be extended away from you with the inside of your left foot on the ground and outside of your right foot on the ground. Place your left hand on your hip, and lift your off the floor. Slowly bring your right leg in towards your chest. Make sure that your hips remain lifted and the weight is in the inside of your left foot. Hold for 30-45 seconds. Lower and repeat on the other side. This total body exercise helps to shape and define the muscles in the arms and legs, not to mention those killer abs. To do this exercise, you are going to be rolling your body over a stability ball. Make sure the ball is the right size for your frame. Get in position with your chest on the stability ball. Your hands and feet should be on the floor stabilizing yourself on the ball. Lean forward with your hands out in front of you. Walk your hands out, rolling your body on the ball until your shins and top of your feet are resting on top of it. Repeat the exercise by rolling yourself back into starting position. Be sure to engage your core and keep your body aligned. Look at you! Five steps closer to the killer abs you’ve always wanted! Incorporate at least one of these exercises into your workout routine per week and watch that 6-pack start to peek through. Remember to share your results with us on social!